I never understand why more gardeners don’t grow Pieris. This lovely shrub is commonly known as lily of the valley bush, because of its delicate sprays of bell-shaped flowers that resemble convallaria without the scent. 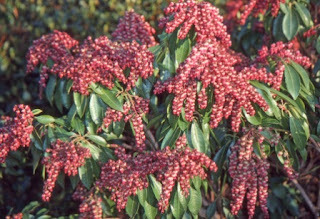 Pieris tick so many boxes in the quest for the ideal shrub: evergreen, attractive foliage, manageable, pest free, pretty sprays of buds through the winter months, beautiful long-lasting flowers early in the year and striking, often brightly coloured new foliage. They are ericaceous, so will not grow on chalk or other alkaline soils, so that puts some gardeners off at the outset. However you can grow them very successfully in pots using lime-free compost, where they will be just as happy as azaleas, camellias and compact rhododendrons, and they have a much longer season of interest. In colder areas the new growth can be susceptible to frost damage, especially if caught by the early morning sun after a freezing night. However if you grow a pieris in a sheltered spot close to the house, perhaps on a porch or under the eaves, it will be protected from damage. Even if the new growth does get caught by frost they will soon produced a replacement flush of showy new leaves. So what’s the drawback? There isn’t one. Pieris are long-term subjects for pots and what is more they are good in pots in shade. They look good throughout the year, and certainly thrive much better than short term flowering subjects in a shady spot. Some eventually grow bigger than others, but they can be carefully pruned after flowering to restrict their size and influence their shape. Pruning promotes new growth and colourful new leaves, but you do not have to do it to achieve this. There are many different varieties to choose from, all with either pink or white flowers, or shades inbetween. Some have plain green, shining foliage; others are variegated with cream and white. The colour of new growth varies from chestnut to scarlet, cream to pink. The best known variety, which has been a garden favourite for years is Pieris ‘Forest Flame’, loved for its white lily-of-the-valley flowers and scarlet new growth. The foliage is emerald green, glossy and the perfect setting for both. ‘Forest Flame’ is a strong-growing variety with an elegant upright habit. A 10 litre plant in a large terracotta or glazed pot will make real impact instantly. 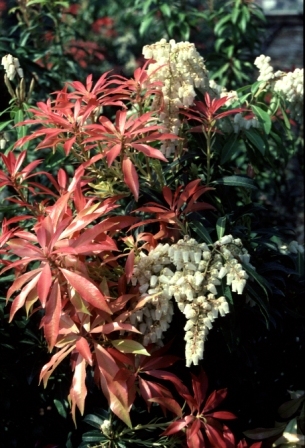 Pieris ‘Flaming Silver’ is a lovely variegated form with pink to crimson new growth and white flowers. Its silver-white variegated dark green leaves are its greatest attribute and really show off the bright new growth. it is a little less vigorous than ‘Forest Flame’ with a bushy, well-branched habit. Pieris ‘Valley Valentine’ is a pieris that is grown for the beauty of its flowers. Branched sprays of deep pink flowers open from deep red buds in early spring. The foliage is dark and glossy and the new growth red-brown. This is a more compact spreading plant, perfect for a pot and a real delight. The time to buy a pieris is now: you will have the pleasure of it throughout the winter months, and you have flowers and new growth to look forward to in spring. Pieris are great value plants and it is worth spending a little more to buy a larger, 10 litre specimen which will create a real impression from day one. Remember, pieris make great gifts – personally I would rather have a pieris than a poinsettia! Pieris really are perfect for pots; always grow them in lime free John Innes (John Innes ericaceous) compost. Water regularly and feed once a year with a granular fertiliser specifically for ericaceous plants.